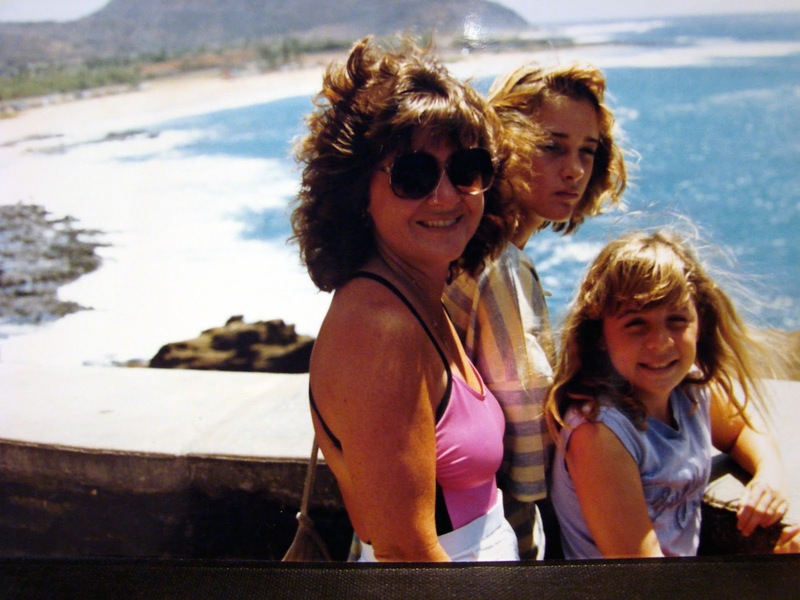 Two photos of me and my daughters when we (with their dad, too)….went to Hawaii…the one and only time the four of us went there together. ETA: I take that back. The older one went to UH-Hilo for one year, and we all went back when we took her back for the start of that year. DOH! The oldest daughter was 13, the younger 11. We had a blast! 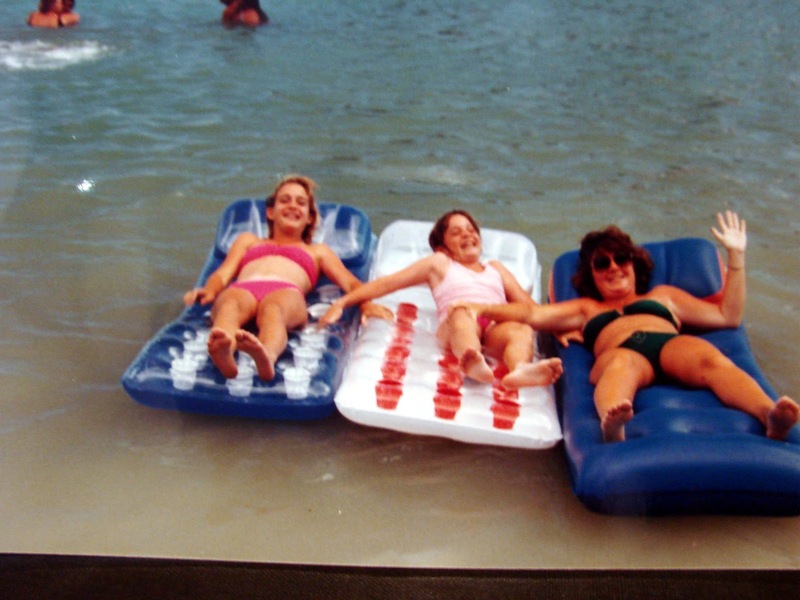 Oh, how I long for the thick hair I had back then, at age 36…..probably the best tan I ever had, too. Being of Scotch-Irish-English descent, it was usually burn-peel for me. I had to work VERY slowly to develop this kind of tan. And no, the oldest wasn’t being sullen. Just a poor snap by the husband. This next picture, us girls were on these rubber (plastic) rafts at the Hilton Hawaiian Village’s lagoon. And I LOVED it. Probably the best afternoon of my life! I don’t swim, but the lagoon was self-contained, and not deep at all, so we could just float without a care in the world, and we did. Just taking off from the ‘shore’ here. Such a wonderful memory!!! Have you ever been to Hawaii? With family? What are your best memories of that or any other specific family trip? This entry was posted in Uncategorized and tagged Throwback Thursday on October 19, 2017 by Silver Willow. Precious photos! Never been to Hawaii but I have some similar photos and happy memories from a holiday in the Bahamas with our two daughters when I had just turned 40. Love the photos and memories you shared. I've never been to Hawaii but it sure sounds like a beautiful place. Never been but I'm sure it's a great place to visit. Lovely throwback photos too. Greetings! A precious memory! Hawaii is on the bucket list! I have never been to Hawaii. It certainly looks inviting, but the Bahamas are so much easier if one lives on the east coast and has a week off in the winter to escape snow and ice for a bit. Lovely pics of the three of you. I did visit Hawaii a few years ago and stayed at that same resort with my hubby and kids. We had a fabulous time! I remember we saw some penguins at the resort. Beautiful pics of you and your girls. Good memories for you. I take a lot of photos and not always that many of family, but they are the meaningful ones when all is said and done. fun pix!! Never to Hawaii. Just about every island in Caribbean except st. barts. Maui is on my bucket list. Surprised the kids with packed bags ready to leave when they were 5, 8, 10 and 13. Had a great time….surfed, swam, catamaraned and took it easy. It was a fabulous trip and I'd go back quick as lightening given the chance. Fun pictures….you've got great hair. Aw, very sweet! These are great memories. Loved the pictures. That has to be a fist full of great memories for all of you. Lucky you and no–I have never been. Spent a lot of time in my youth in Key West. Similar island life with out the cool mountains, sweet mucic and grass skirts. I've never been to Hawaii but I'd love to go. Love the photo of the 3 of you on the lilos! I've been to Hawaii twice – first time in 1990 then again the following year with my daughter, then husband and stepdaughter. We did the Elvis show twice and also went on sailing ships off the coast. We snorkelled and had a great time. I'm sure we'll go back again one day as the airfares from New Zealand are pretty reasonable these days. Thank you, and thank you! Keep us informed about your Christmas trip! It truly is. And thank you! Understood, re the convenience of one location over another. And thanks! thank you, and glad you've made it there, especially with family! Been briefly to FL, but didn't get to do Key West. Would've loved to. And thanks! thanks, Joe! Hope you get an opportunity to go, at some point! Oh, what a fun look back! Isn't it glorious to remember those times?